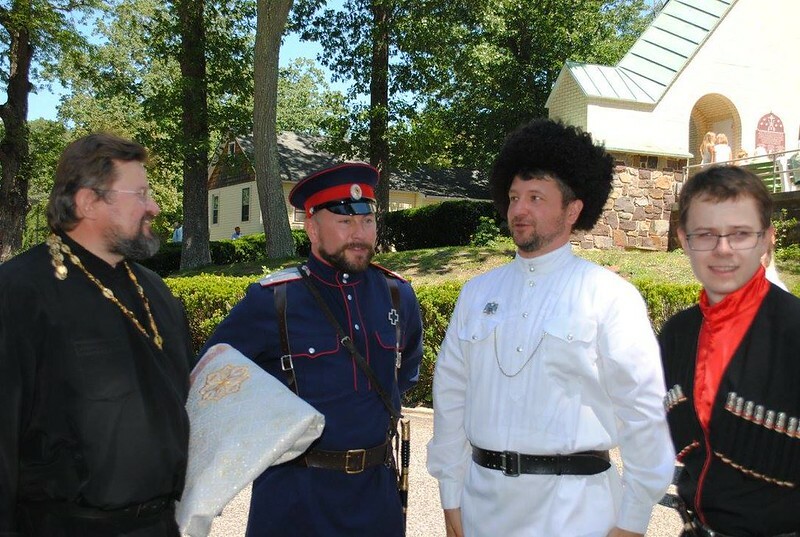 On July 30th, 2017 members of the Cossack Congress in America participated in the celebration of Saint Vladimir Day at Saint Vladimir Church in Jackson, New Jersey. Attending the celebration at Saint Vladimir Church is a Cossack tradition and has been upheld for over 50 years. Present members of the Cossack Congress in America included the Kuban Cossack Viosko Abroad (Howell, New Jersey), All Cossack Stanitsa Vineland (Buena, New Jersey), and the All Cossack Stanitsa Nikolskaya (Chester, Pennsylvania). Additionally, Stanitsa Nikolskaya took on the initiative to prepare and present a "Cossack Lavka" having Cossack artifacts, history, and traditions on display while engaging in friendly conversations with visitors to the tent. Upon the conclusion of the divine liturgy, which was led by Metropolitan Hilarion of Eastern America & New York, First Hierarch of the Russian Church Abroad co-served by Archbishop Gabriel & Bishop Nicholas, the Cossacks engaged in a festive picnic around the tent with Cossack songs and conversations. The First Hierarch of the Russian Church Abroad Metropolitan Hilarion took the time to familiarize himself with the Cossack display and gave his blessing and gratitude to all Cossacks present for continuing the Cossack tradition on Saint Vladimir's day.